Yesterday we posted a sneak peek at the deals set to hit Amazon this Black Friday. You, me, Amazon all noticed that one thing was missing: DS price breaks. Don't worry, Amazon's got your back. The crew emailed me this morning to apologize for the missing DS-related price cuts and, to make up for that, they've given us a short list of some of the DS deals and also dropped a few more deals that will be hitting come this Friday. Anyone up for getting a free game when you buy a 360, PSP or PS3? Hit up the jump for the details on the new deals. Also a bit of explanation on some of yesterday's that may have been a bit confusing. 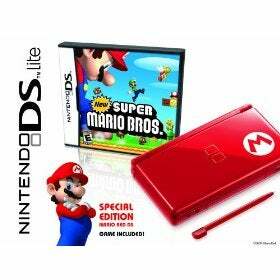 Also, if you're in the spending mood now, hit up Amazon for two deals they've started today.Nintendo DS *Available now through December 1st at 11:59pm PST: Nintendo DS Lite Limited Edition Red Mario with New Super Mario Bros - $134.95 (Reg. 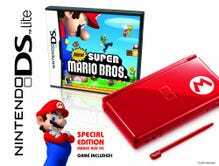 $149.99) *Available now through December 1st at 11:59pm PST: Nintendo DS Lite Limited Edition Ice Blue with Brain Age and Carrying Case Bundle - $134.95 (Reg. $149.99) *Friday Only - Star Wars: The Force Unleashed - $19.95 (Reg. $34.99) Build-A-Bear Workshop - $9.95 (Reg. $19.99) Touchmaster - $9.95 (Reg. $19.99) MySims Kingdom - $19.95 (Reg. $29.99) "Friday-only" deals ( As these deals end, Amazon will reveal new deals throughout the weekend so stay alert, because it's going to be a long weekend.) -Buy a PSP 3000 Limited Edition Ratchet and Clank Entertainment Pack and get one of these PSP games for free: Daxter Spongebob Squarepants The Yellow Avenger Tekken - Dark Resurrection Star Wars Battlefront: Renegade Squadron Star Wars Battlefront II SOCOM U.S. Navy Seals Fireteam Bravo Patapon Medal of Honor: Heroes Lego Star Wars II: The Original Trilogy Grand Theft Auto Vice City Stories Mortal Kombat Unchained WWE Smackdown vs. Raw 2008 Buy a select Nintendo DS console and get Disney Club Penguin: Elite Penguin Force for only $5 Buy an Xbox 360 Arcade Holiday Bundle and get Dance Dance Revolution Universe 3 with Dance Mat for free Buy a PlayStation 3 80GB console and get Resistance 2 Collector's Edition and a PlayStation 3 Component AV & USB cable free Buy a PlayStation 3 80GB console and get Wall-E Blu-ray (2-Disc set) and Disney Sing It! Bundle with Microphone for free And now for your clarifications: First, our "Friday-only" deals will be live at Amazon.com on November 28th (Black Friday) from 12:00am PST (3:00am EST) until 11:59pm PST (2:59am EST on Saturday morning) OR until we have depleted our promotional quantities, whichever comes first. The non-"Friday-only" deals will go live at Amazon.com on November 28th (Black Friday) from 12:00am PST (3:00am EST) until December 1st (Cyber Monday) 11:59pm PST (2:59am EST on Tuesday morning) or until we have depleted our promotional quantities, whichever comes first. We would also like to note that we will be having Monday-only deals that will go live at Amazon.com on December 1st (Cyber Monday) from 12:00am PST (3:00am EST) until 11:59pm PST (2:59am EST on Tuesday morning) or until we have depleted our promotional quantities, whichever comes first. Check out the rest of Amazon's Black Friday tease here.